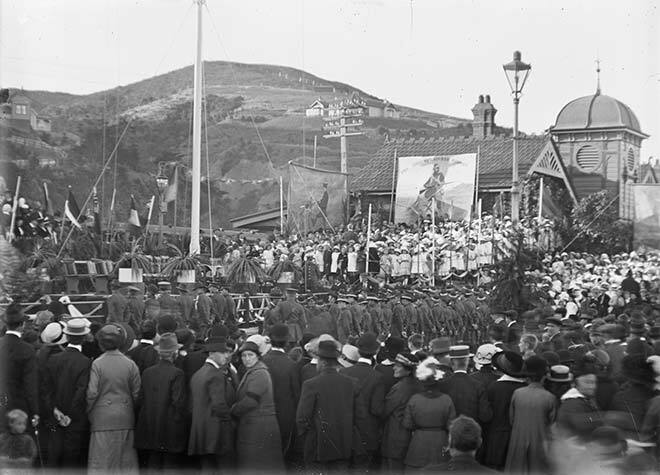 Crowds gather around a commemorative flagpole at Petone railway station on New Zealand's first Anzac Day, 25 April 1916. The day marked the landing of troops of the Australia and New Zealand Army Corps (Anzacs) at Gallipoli the year before. Although it ended in military defeat, the Gallipoli campaign helped forge a sense of New Zealand nationhood. Anzac Day was formally made a public holiday in 1920.